To the children alienated from a Protective Parent, we wish to speak to your hearts. Remember what it was like to be with your loving parent. Remember the fun. Remember how you were loved. All the little ways and all the big ways your parent showed you how much they cared. Reach out to that loving parent today. Let them know you remember. Let them know you appreciate their love . 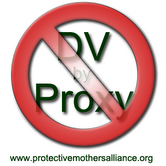 Because the term is so emotionally charge for protective mothers, and for all the reasons above, we feel DV by Proxy is a better choice. Please keep in mind others still use the term Parental Alienation. Since PMA International did not author the piece, the term parental alienation or alienation may be used. Mindfulness is defined as a state of being present and open to the moment by moment experience of your life. It means engaging in your life as a fully awake and aware person and as much as much being attuned to the people with whom you interact. …help you remain clear and calm in times of stress through awareness of and attunement to your own state of mind and body. You can also gain clarity and calmness through breathing and meditation practice. … help you be present when interacting with your children rather than being consumed with and distracted by thoughts and feelings about the past or present which can take you away from appreciating and engaging with your child. …help you accept the imperfections in yourself and the world so that you are not overwhelmed with feelings of shame in your own limitations or with feelings of frustration and anger at the injustice of your situation. …help you forgive your children for betraying you and themselves so that you can keep your heart open to them despite their engagement in behaviors that hurt or sadden you. …help you make more active and conscious choices in your parenting in order to avoid discipline that could entrench the alienation against you. … help you engage in active listening of your child which can deepen and strengthen your relationship. As a co-parent “under fire” you will need all the help you can get to remain calm in the face of attack and insult, to remain generous of spirit and true to your best self, and to cultivate compassion in your child and you. Consider mindfulness one source of that help.